Obituary for Viola (Staley) Birch | Crandall Funeral Home Inc.
Viola Birch was born on January 24, 1922 in Coalville, Utah to Elmer Doris and Margaret Matilda Staley. 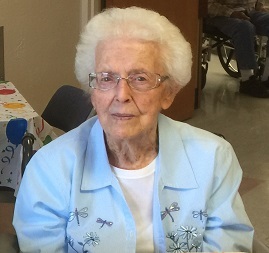 She passed away on April 10, 2019 at Rocky Mountain Care in Evanston. She was the second of 9 children. They were raised on a sheep ranch in Upton, Utah. On October 17, 1939, she married Rex Birch and they moved to Atlantic City, WY. For 2 years (1942-1944) they moved to various places while Rex was in the U.S. Navy, then returning to Atlantic City. In 1952 they moved to Lyman to start a construction company where Vi continued to drive trucks until she was 73 years old. She always had a tale to tell about her driving experiences. She enjoyed spending the winters in Mexico and Yuma, AZ, traveling in their motorhome, doing embroidery work and hunting rocks. Viola is survived by a son, Dee (Glenys) and a daughter, Dixie both of Lyman. She was a member of the Church of Jesus Christ of Latter-day Saints. She was preceded in death by her husband, parents, 2 brothers and 3 sisters. Services will be 10:00 AM Tuesday, April 16, 2019 at Crandall Funeral Home in Evanston. A viewing will be one hour prior to the service. Interment will be in Lyman Cemetery.